“Benedetta Falugi è una fotografa indipendente che vive in Toscana. Il suo approccio con la fotografia avviene quasi casualmente ma l’incontro con il nuovo mezzo espressivo è folgorante. Il suo lavoro è stato pubblicato su giornali e libri di settore. Ha esposto in varie mostre sia collettive che personali, in Italia e all’estero. Tra i suoi clienti: Visa (New York), Nokia (United Kingdom), i marchi di moda Mal Familie e Noodle Park (Italia), l’Università Özyeğin di Istanbul, la Casa Editrice Rubbettino (Italia). Le sue foto sono rappresentate dalla prestigiosa agenzia Art+Commerce Agency di New York collezione PhotoVogue. “Benedetta Falugi is an independent photographer based in Tuscany, Italy. She initially approached photography in a rather casual way, once a passion was realised she continued to study photography through various workshops and as an autodidact. Corresponding with her independent studies Benedetta began a personal project attempting to research ‘places of the heart and people living there’. Her work (made in analogue), has been published in several Photographic Magazines and Books. Her photos photos have been part of various personal and collective Exhibitions, both in Italy and abroad. Between her clients: Visa (New York), Nokia (United Kingdom), fashion brands Mal Famile and Noodle Park (Italy), Istanbul Özyeğin Üniversitesi (Turkey), “Rubbettino” Italian Publishing House. Her photographs are represented by Art+Commerce Agency NewYork- PhotoVogue Collection”. From November 2014 she’s member of Photography Collective, InQuadra. *My first monographic photobook is out NOW on Galleria Disastro*! 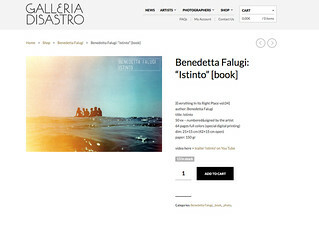 Go and get your copy here: BENEDETTA FALUGI -ISTINTO ; 50 ex – numbered & signed by the artist. Update: just 4 in stock! I'm represented by ART + COMMERCE (New York) Agency. My shots are for sale for editorial and advertising purpose in Photovogue Collection.